Whitaker brings the reader to the state of Florida, and into the fictional location of Archie F. Carr School. We follow an eighth grader named Chase Clark and his adventure with his school’s football team. Both Chase and his best friend, Tripp Stevens, find themselves on the varsity team after playing for their JV team for some time. Soon after this happens, however, Tripp gets injured during a game. The climax happens inside the team locker room, where the football team’s aide tries to discover if Tripp has a concussion or not. Knowing that he must choose between their friendship and Tripp’s well being, Chase reveals the symptoms of a concussion to the aide, leading to Tripp’s temporary suspension from the team. The rest of the book follows Chase trying to fix his friendship with Tripp. Whitaker’s writing style was simply unentertaining to follow. The way he writes Snap Decision leads me to believe that he had a tough time following a good outline. In one instance, an entire chapter revolves around Chase and Tripp’s father going to a recruiting office for Florida’s NFL team. This section had very little to do with the plot of the book; there were several other chapters much like this. 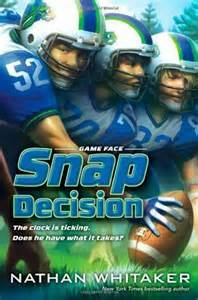 If there wasn’t an underlining Christian tone within the book, Snap Decision wouldn’t have any value. A very simple tone revealed; “God has a plan for everything.” In the second half of Snap Decision, Chase tried to rekindle his friendship with Tripp to no avail. Near the end of the book Tripp flat-out slammed the door in Chase’s face. He cried out to God saying, “He’s all yours!” Chase found that he had to trust that God had a plan for his future and that this phase of his life would be completely in God’s power. It’s a realistic, if not a very optimistic ending. The target readership is males ages 11-16. Chase found that he had to trust that God had a plan for his future and that this phase of his life would be completely in God’s power.